Smart's apparently got a new pocket monster afoot. 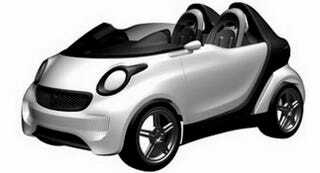 A patent filing revealed this rendering of a speedster-style Smart concept with no doors, roof, or windshield. If it's not careful, someone might toss a Poké Ball at it. While the concept makes us wistful for the previous Smart Roadster, there's no information in the patent filing about what this design might hearken (the designs were submitted on November 16, 2010). Could it be a concept bound for, say Geneva, spotlighting the next-gen Smart Fortwo? Perhaps it'll celebrate the 10-year anniversary of the company's Crossblade concept in 2012. But should some bygones simply remain bygone?